Watch a preview of “A Different Kind of Farm” using 4 quadrants of video to illustrate the goals of ocean conservation being promoted by Carol & Craig Schmarr, who founded the world’s first seahorse farm. Carol discusses the efforts in captive breeding of seahorses and the impact of the world’s ecosystems – particularly Hawaii. An up-close look at the Hawaiian Seahorse farm, Ocean Rider and interview with Carol Cozzi-Schmarr. Carol discusses the efforts in captive breeding of seahorses and the impact of the world’s eco-systems – particularly Hawaii. 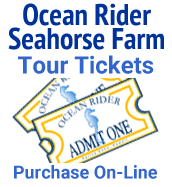 Tours of the Ocean Rider Seahorse and Sea Dragon Farm are considered to be Kona’s best kept secret! This tour is a must do for all visitors and residents of Kona, Hawaii. Tickets may be purchased on-line 24 hours or more in advance! Tickets for “walk-ins” are available at the farm gate the day of the tour. Please call ahead to make reservations. Tours times and schedules are Monday through Friday, subject to availability and holidays. Group and educational tours available.